Police have stepped up their hunt for three people who ram raided a Co-op store in Rudgwick. Thieves smashed through glass at the supermarket, in Martletts Corner, using a stolen forklift in the early hours of Sunday morning (September 9). A cash machine was then yanked out of the wall and loaded into the back of a 4x4. Officers said the vehicle and a silver Subaru then fled from the scene heading south towards the A281. 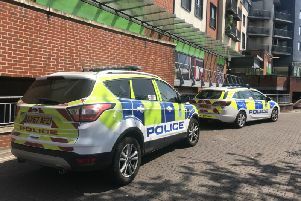 The raid took place at about 2.45am and police have released descriptions of three people wanted in connection with the incident. Detective Constable Kirstie Neal said: “The three suspects wore dark clothing and masks covering their faces and were at the scene for around five minutes. “We are appealing for anyone with information on this incident to come forward to us immediately. Anyone with any information is asked to report it online or call 101 quoting 180 of 09/09.